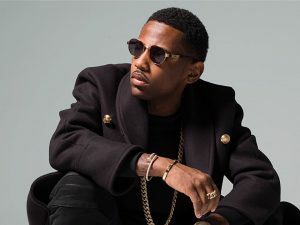 American rapper Fabolous scored his first big hit, “Can’t Deny It,” right out of the gate in 2001, instantly establishing himself as a rising East Coast rap star with a combination of street-savvy toughness and pop crossover appeal. The Brooklyn rapper (born John David Jackson on November 18, 1977) was one of the first East Coast MCs to embrace the bling mentality of the South as well as the gangsta swagger of the West Coast, all the while incorporating a subtle undercurrent of pop-rap into his music. He was among the first of a new breed of New York City rappers, later and most notably to include 50 Cent, who were able to cross over among multiple markets without losing street cred. His youth was key, but so was his bravado, and when Fabolous could balance this persona optimally and find a production formula to fit, commercial success resulted. His breakthrough single, “Can’t Deny It” — a Rick Rockproduction featuring a 2Pac sample and a Nate Dogg feature, as well as a catchy hook — preceded his debut album, Ghetto Fabolous (2001), and generated quite a bit of buzz. The album also featured production work by the Neptunes, but only managed one other single, “Young’n,” which failed to match the success of “Can’t Deny It.” When Fabolousreturned with his sophomore album, Street Dreams (2003), he capitalized on his initial renown, racking up three major hits: “Trade It All,” “Can’t Let You Go,” and “Into You,” with the latter two breaking into the Top Five of Billboard’s Hot 100. Later in 2003, More Street Dreams, Pt. 2: The Mixtape hit stores just in time for the holiday season. Comprising various street-level recordings originally released on mixtapes, this compilation didn’t spawn any hits, but it did reaffirm Fabolous‘ hip-hop credentials in the wake of his string of pop crossover singles. The following year brought with it another album, Real Talk (2004), which didn’t offer any major pop crossover hits (“Baby” was a minor one) yet did boast a monster Just Blaze production, “Breathe,” which further shored up Fabolous‘ hip-hop credentials. The young rapper took most of 2005 and 2006 off, and shortly before the scheduled release of his next album in late 2006, he made headlines when he was shot in the leg and subsequently charged with weapons possession (police found two guns in the car that transported him to the hospital). Def Jam — which signed Fabolous after sending Musiq to Atlantic in a unique trade situation — released From Nothin’ to Somethin’ (2007). The album debuted at number one on Billboard’s Top R&B/Hip-Hop Albums chart (number two overall) and spawned a series of singles, including the Top Ten hit “Make Me Better” featuring Ne-Yo. Two years later the hit single “Throw It in the Bag” would land on his album Loso’s Way, a loose, conceptual full-length inspired by the film Carlito’s Way. In 2010 he released There Is No Competition 2: The Grieving Music, a “concept mixtape” aimed to bury rival rappers. The S.O.U.L. Tape and There Is No Competition 3: Death Comes in 3’s both arrived in 2011. A second S.O.U.L. Tape was issued the next year. It featured guests like Trey Songz, Pusha T, J. Cole, Wale, and Cassie. Although a pair of singles was released in 2013 to promote Loso’s Way 2 — “Ready” with Chris Brown and “When I Feel Like It” with 2 Chainz — the album was eventually scrapped after years of continual delays. Instead, Fabolous unveiled his sixth LP, The Young OG Project. The 2014 effort featured Rich Homie Quan, French Montana, Kevin Hart, and Chris Brown. It peaked at number 12 on the Billboard 200 and in the Top Three of the R&B/hip-hop and rap charts. A pair of mixtapes followed in 2015 before Fabolous returned to the studio for the follow-up to Young OG. In early 2017, a single called “Goyard Bag” with Lil Uzi Vert appeared, from his mixtape, Summertime Shootout 2: The Level Up. Later that year, it was announced that his next LP, Friday on Elm Street, would be a collaboration with Jadakiss. The first single, “Stand Up” arrived in October, followed a month later by the album’s release.